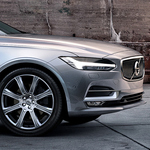 The 2019 Volvo V90 is a popular and roomy crossover SUV. This vehicle brings many classic Volvo benefits to the table including enhanced safety features and sturdy suspension systems. In addition, the 2019 V90 also includes many fuel efficiency enhancing features and technologies. One such fuel efficiency promoting technology employed by the Volvo V90 is its specialized stop start system. This system is employed by the Volvo Geartronic transmission that provides up to eight ranges of potential. The Volvo stop and start system can seamlessly deactivate motors when the vehicle sits at idle for proscribed periods of time. This feature can save significant amounts of fuel as well as wear and tear for vehicles that frequently commute or spend time sitting in traffic jams. In addition to the stop and start system, the new Volvo V90 also employs a special Eco-drive mode that optimizes a number of vehicle systems to perform at optimized or reduced levels.